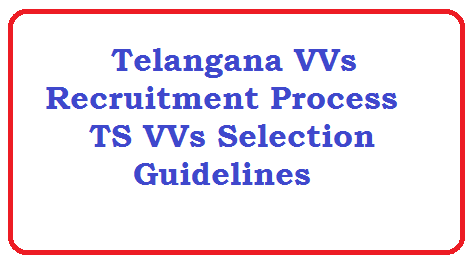 Telangana VVs Recruitment Process VVs Selection Details. As per the Annexure of GO.No.97, SE(Prog.I) Department ,dt:29.06.2016 The Guidelines for engaging Vidya Volunteers in Telangana State were released. This VVs Selection process will be followed until any changes are made in this Selection method. Guidelines for engaging 11428 VVs in Telangana Schools for 2017-18. Eligibility for appointment as Vidya Volunteers in Telangana State. 1. The services of Vidya Volunteers will be engaged from the Stipulated Date in the Schools as approved by the District Collector concerned. Their services are purely temporary and can be terminated before the last working day also, based on justifiable grounds, by the School Management Committees (SMCs). 3. Candidates should have completed 18 years of age and upper age limit is 44 years as on 1st July, of the concerned year, (5) years relaxation is given in case of SCs / STs /BCs and (10) years for Physical Challenged persons. 6. The Candidates shall apply online and submit a signed print out of the application he/she uploaded along with the Certificates required to the Mandal Educational Officer of the Mandal to which he/she applied within the time specified. The Mandal Educational Officer shall cause verification of the applications with reference to the Certificates enclosed and submit the same to the District Educational Officer duly countersigned. 11) Mandal is the unit for engaging of Vidya Volunteers basing on the roster points allotted to the Mandal. Merit lists shall be generated for each Mandal. As far as possible, Candidates belonging to the same Mandal shall be engaged as Vidya Volunteer. If qualified Candidate is not available for a particular roster point in the Mandal, Candidates from the other roster points may be taken from the same Mandal. For Example If no ST (W) Candidate is available in the Mandal, ST (General) may be considered . If no ST candidate is available in the Mandal, SC (W) may be considered . If no SC (W) Candidate is available in the Mandal , SC (G) may be considered . If no SC candidate is available in the Mandal, following sequence shall be followed BC-A (W), BC-A (G), BC-B(W), BC-B(G), BC-C(W), BC- C (G),BC-D(W), BC-D (G), BC-E(W), BC-E(G) , OC(W), OC(G). In case of non- availability of candidates for Ex.Servicemen quota/ PHC quota in the Mandal, Candidates from Open Completion list may be considered. 16) The District Collector shall draw a detailed Schedule for completing the selection of the Vidya Volunteers and communicate the List of Vidya Volunteers to the MEOs by the given date and the MEOs shall complete the verification process and furnish the List to the SMCs as per schedule, so as to engage the services of the Vidya Volunteers by the SMCs for the Academic Year 2017-18. The online Application for Telangana VVs will be available at http://ssa.telangana.gov.in/ after the announcement of schedule.